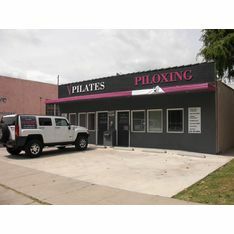 V Pilates is located in Toluca Lake tucked away on Cahuenga Blvd., but with its hot pink and black exterior, the studio is hard to miss!! Piloxing is a combination of a traditional boxing class with pilates movements and, as we found, a bit of booty shaking! Piloxing requires the use of half pound weighted gloves, which adds an extra cardio blast to the workout. The instructor keeps you guessing by interchanging punches and jabs with plie squats and dance moves. Expect to be on your feet most of the workout with a ten minute ab and leg floor session plus cool down. This workout is absolutely suitable for beginners, however it may take you a few sessions to get comfortable with the moves. The studio also offers mat classes, reformer circuit pilates and bootcamp…check back soon for upcoming reviews. There are a few parking spots located in a small lot in front of the studio, but you can also find parking along Cahuenga Blvd. Piloxing has been on our list of workouts to try for months now! Since we love pilates and are always ready for a great cardio workout, we figured this would be perfect! Allyson, our instructor, was so bubbly, had great energy, and obviously had a background in dance. We tried our best to copy her graceful movements, but fell a little short in the booty shaking department. We worked up a good sweat, really enjoyed the boxing movements (especially with the weighted gloves!! ), and know that we will be sore from all the plies. We personally didn’t love the dance portion of the workout, but it offered a nice alternative to our normal routine.